But after reading an article in Time magazine about some successful research on treating anxiety with float tanks, she decided to make a bold move to try it herself, hoping to find some rest and peace. But she still wasn't too sure that floating would help her. Anxiety--the dictionary definition is, “a feeling of worry, nervousness, or unease, typically about an imminent event or something with an uncertain outcome.” To many, anxiety is so much more than that. The ADAA states anxiety disorder is the most common mental illness and affects over 18 million adults in the United States. It’s a feeling of excessive uneasiness that may or may not be connected to specific environmental factors or life events. It can include panic attacks, depression and can have aspects of OCD. Broadly, anxiety disorders include generalized anxiety disorder, panic disorder, social anxiety disorder, PTSD, OCD, and others. Medical treatment is out there (though less than 40% seek help) and includes a variety of approaches from pharmaceutical intervention to behavioral therapy to meditation. Dr. Justin Feinstein hopes to add an alternative treatment to the mix -- floatation therapy. Dr. Feinstein is a researcher with the prestigious Laureate Institute for Brain Research (LIBR) in Tulsa, OK. LIBR has the only float lab and research center in the country. 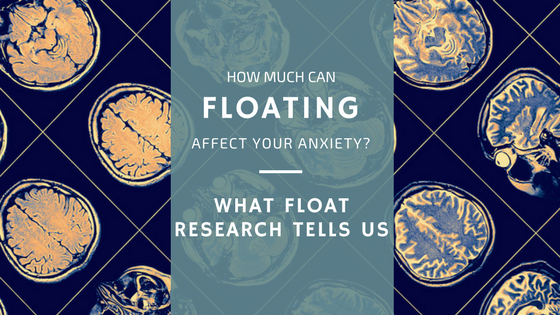 There, he and his team have been studying how float therapy can be used to help patients with disrupting the network in the brain that triggers anxiety, the salience network. The salience network is a collection of regions in our brain that tells us which stimuli are worth us noticing. All of the input from our environment is evaluated by this network. An article in Wired magazine provides a high-level explanation of the network’s function, “A far-off siren, for example, might do little to change a driver’s course, but a siren a few cars back would likely persuade the driver to pull over.” The salience network tells us to ignore the siren or pull over. Studies have found the more highly connected that network is, the higher our “fight or flight” response may be. That means the more active/connected certain parts of the salience network, the higher our level of anxiety. The brain is wired to pay too much attention to every bit of stimuli. Imagine the anxiety and tension living in a body where nearly everything can feeloverwhelming and urgent all the time! There are some medications created to help people deal with and get relief from this feeling. Feinstein is no stranger to anxiety meds. In 2005 he was part of a team that tested the drug Ativan - an effective but addictive anti-anxiety drug. On the drug, the amygdala, the part of the brain where fight or flight response originates, shuts down. This is significant because this doesn't even happen when we relax, but it's an important part of that feeling of serenity. Present day, in his float lab, Dr. Feinstein gathered participants for his study and divided them into two groups--those who would float for 90-minute sessions and those who would relax in a chair for the same period of time. He used MRI and water-proof EEG to study participants to evaluate them both pre and post-float. The preliminary results are very promising. They found the highly connected areas of the brain had a huge drop in that connectivity post float. Ninety minutes in the tank affected the brain in the same way that pharmaceuticals do by turning down the hyped up salience network. The difference? Floating doesn’t have the side effects of the traditional medication. While much more research is needed to sway large organizations like NIMH, Dr. Feinstein is on the right path to offering an alternative to pharmaceuticals and faster paths to symptom improvement than traditional meditation. Mary came out of her first float with relaxed shoulders and a smile on her face. She told us that while it took her awhile to relax, she felt like she could "take a deep breath for the first time in a long time." Dr. Feinstein is on the cutting edge of float research. Want to learn more? You can watch his talks at the annual Float Tank Conference here and here. We look forward to hearing more from his team and their research. If you're ready to book your float, you can book online or give us a call at 615-567-7222 and we are happy to help!